Jacqueline E. Campbell is a partner in the casualty department of the firm’s Philadelphia office. She focuses her practice on the defense of commercial vehicle, construction accident, and general liability cases. Her commercial vehicle experience includes the representation of insured and self-insured trucking companies in numerous significant cases. 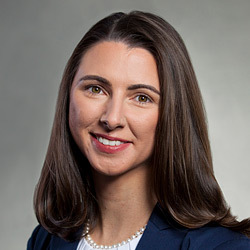 Ms. Campbell has coordinated accident investigations and handled all aspects of commercial vehicle litigation from initial pleadings through jury trial and appeal. Ms. Campbell also has significant experience in representing manufacturers in asbestos litigation in Pennsylvania. She has taken plaintiff’s depositions and drafted and argued dispositive motions in numerous matters. Ms. Campbell has also prepared trial preparation materials in numerous asbestos cases. Successfully defended client with limited coverage in four-day jury trial on liability against five Plaintiffs and one co-defendant. All five Plaintiffs presented a case against the client because they settled with co-defendant prior to trial. Obtained a defense verdict in the arbitration of an intersectional accident that involved conflicting testimony on the color of the traffic lights and damages that exceeded the client’s policy limits. Obtained summary judgment for the lessor of a tractor trailer in a Philadelphia County action. Drafted brief of appellee in the appeal of an order granting summary judgment, which caused appellant to discontinue its appeal fourteen days thereafter.